Super easy, healthy, and delicious Gluten-Free, Vegan, and Refined Sugar-Free Blackberry Walnut Oat Bars! These make a great breakfast, snack or treat! 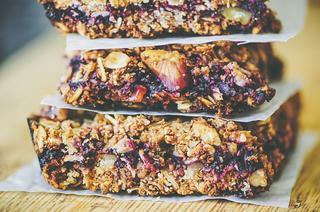 These fruit, nut & oat bars are not only healthy & delicious, they also strike a great balance of textures & flavors! Crunchy, salty, sweet & decadent....they make a great snack, breakfast, dessert or quick energy boost any time of the day! Preheat oven to 375°F. Line a round or square baking pan or dish with parchment paper, set aside.If making your own oat flour, blend your whole oats for about 3 minutes, or until the consistency of a fine powder.Combine oat flour, whole oats, 4 tbs sugar, baking powder, cinnamon and salt. Add your melted coconut oil and stir to combine evenly.Using your fingers, firmly press down half of the oat crust mixture into the bottom of your parchment lined pan. Bake for 15 minutes, then remove & let cool while you prepare your berries.In a saucepan over medium-high heat, add your blackberries & the remaining 2 tbs of sugar. Bring to a boil, then let simmer for 10 minutes. Stir in your chia seeds and continue to let simmer (about 5-10 mins more) until it has thickened a bit. Remove from heat and stir in vanilla extract. Let cool (it will continue to thicken while cooling).When blackberry mixture is cool, spread it over the cooked oat crust in your pan. Sprinkle your chopped walnuts evenly over your berry layer, and press down slightly. Then, top your blackberry & walnut layers with the remaining oat crust mixture, covering your berries completely & pressing down firmly.Bake in your 375°F oven for 40 minutes or until all is firm and beginning to turn golden.Let cool completely before slicing into bars & serving (at least one hour), and keep stored in an airtight container in the fridge. Enjoy!